Upcoming Event: lululemon athletica Fashion Valley Celebrates 1 year! Here's a fun event at Fashion Valley for lululemon's 1 year celebration. Enjoy snacks, sips, a DJ (with a surprise) and an acro performance! 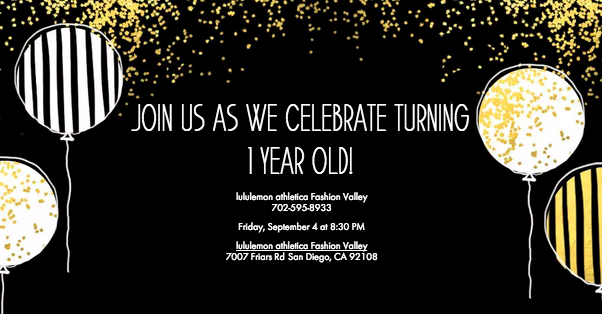 "Join lululemon athletica Fashion Valley as we celebrate our first birthday this Friday, September 4 at 8:30 PM! We wouldn't be here today if it wasn't for all of you and can't imagine celebrating without you! See you on the dance floor." To RSVP, visit this link and choose Yes. Make sure you sign up with your own email and username.